Advertise On The Grand Strand Business Network! » Feature Your Company Profile There are 2 ways to feature your company profile with us. You must already have your company added with us on the network to take advantage of these options. TO ADD YOUR COMPANY, PLEASE CLICK HERE. With either of the options above, just like when you added your company with us, you will also receive a Free "Social Media Announcement" of your new advertisement running with us! We share it on multiple grand strand area social media pages that have 25,000+ combined followers and our editor (who has almost 4,000 grand strand area friends on his personal FB profile) shares it too! --- 1,000s will be reached and see your company/profile/ad in just the first 24/48 hours alone! 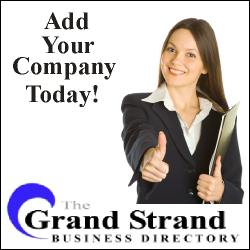 Until that time, please email our editor, Joey O'Connor, directly at with the subject heading 'Advertising On GrandStrandBusiness.com' and let him know which option you would like to take advantage of. Thanks! its partners and licensors. All Rights Reserved.